Amerigo Vespucci is about to arrive in Castellammare di Stabia. She will be moored at Stabia Main Port on 5th and 6th of October and will be open to visitors. The training ship Amerigo Vespucci is back in the old Bourbon basin of Castellammare di Stabia, where she was launched on February 22, 1931 and will be moored on 5th and 6th of October at Stabia Main Port, in the city center. 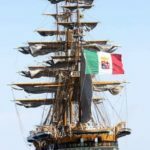 “A very important event – commented Antonio Pannullo, Mayor of Castellammare di Stabia – the Vespucci has always been symbol of the ancient art of shipbuilding and sailors that distinguishes our city and is a sign of hope for growth and economic development for the city of waters. I want to thank the Navy, the Port of Castellammare, the company Stabia Main Port and the Port System Authority in the Tyrrhenian Sea with whom we have worked together to guarantee this stop in town. “It’s not who begins, but who persists”, is the motto of the training ship Vespucci, built at the Royal Bourbon Fincantieri Shipyard, for which we are working hard to resume the production. 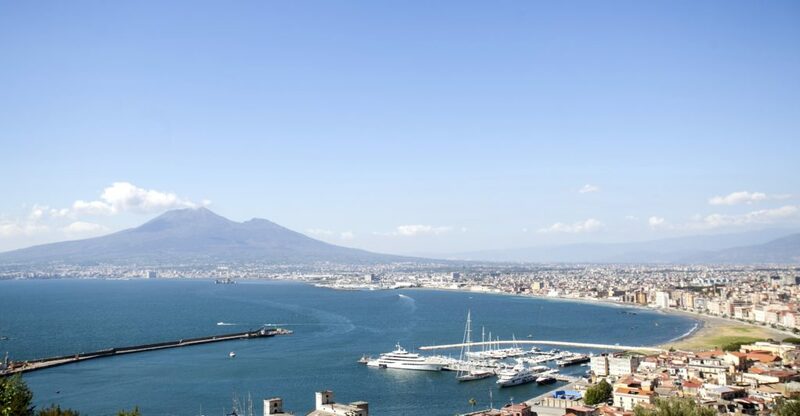 The arrival of the Vespucci is an invitation to the Stabians to believe with us all in a new growth of a nature-loving territory, located in the center of the Mediterranean, between ancient Pompeii, the romantic Sorrento and the imposing Vesuvius. 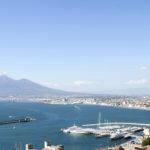 Not surprisingly, the stop will be at Stabia Main Port, where already the Vespucci used to be berthed and which has become today a reference point for Superyachts at the center of the Mediterranean, which has hosted during this summer royal families, Hollywood actors and prestigious entrepreneurs of international fame”. 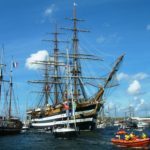 The Vespucci shall berth therefore at Stabia Main Port on October 5th in the morning and will set sail again on October 6th, in the afternoon. It will be open to visitors on Thursday, October 5 from 15 to 18.30 and Friday, October 6 from 10 am to 12.30 pm. “We have of course predisposed a security service and as Harbor Master we will coordinate and monitor each arrival operation, mooring and stay – explains Guglielmo Cassone, Captain in chief of the Port of Castellammare di Stabia – Onboard there will be only the crew of the Vespucci which then will continue the journey southwards on October 6th. There will be tours for the Authorities and a there will be a chance to visit her publicly on Thursday afternoon October 5 and in the morning of October 6. 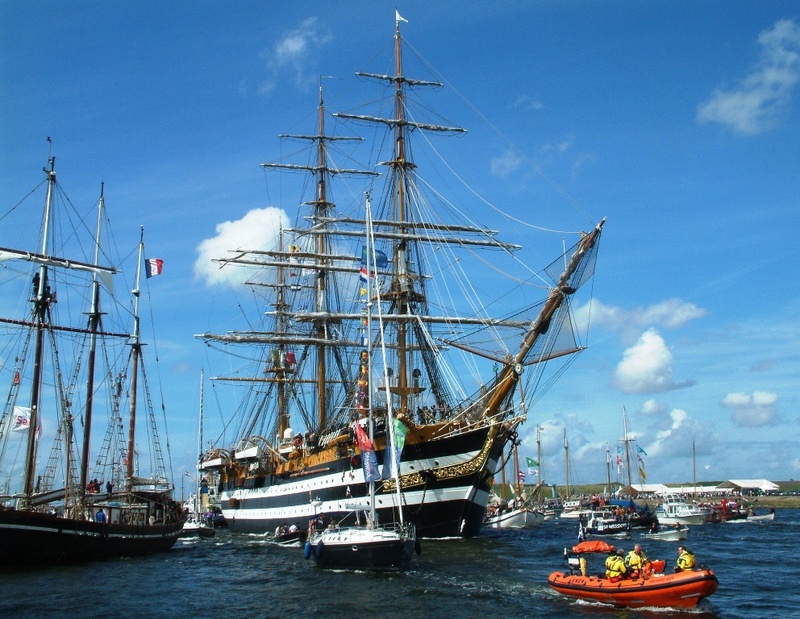 For the occasion, it will be also set an information point about the Navy and the training ship Amerigo Vespucci. The stop will be at Stabia Main Port, where she used to be moored once upon a time. 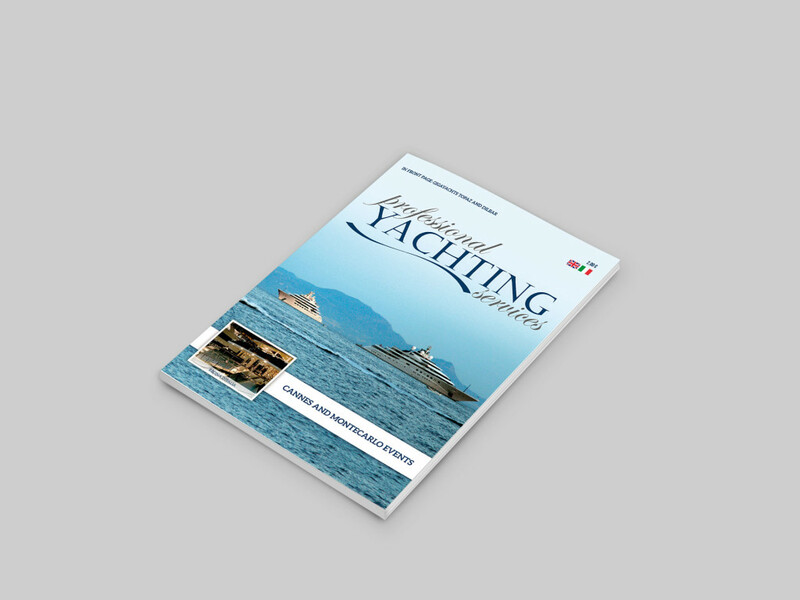 The place has now become a reference point in the Mediterranean for Superyachts. It will therefore be an important opportunity to celebrate the history of Castellammare di Stabia”. The Amerigo Vespucci was designed together with twin ship Cristoforo Colombo in 1930 by engineer Francesco Rotundi, Lieutenant Colonel of Naval Engineers and director of the Royal shipyards of Castellammare di Stabia, resuming projects of the sailing ship Monarca, the flagship of the Royal Navy Kingdom of the Two Sicilies, then renamed King Galantuomo when she was taken by the Sardinian Marina after the conquest of the Two Sicilies and the consequent birth of the Kingdom of Italy. The Royal Navy of the Two Sicilies was avant-garde among the pre-unification Italian States and its ships, together with the Sardinian-Piedmontese ones (or rather Ligurian) formed the core of the Italian navy, as one can observe in the Naval Museum of La Spezia. The projects which were copied belonged to Neapolitan naval engineer mr. Sabatelli and were kept in Castellammare di Stabia along with the technologies needed to build this type of boat. The last time she came to town was in 2011, celebrating the 80th anniversary of her construction and the 150th of Italy United. “It’s a precious moment of sharing and reflection – says satisfied mr. Pietro Spirito, Chairman of the of Port System Authority of Central Tyrrhenian Sea – the arrival of Vespucci in Castellammare which will be moored between yachts that relentlessly accompanied the summer of Stabia Main Port and full expression of how we can build the future of a city starting from its roots, they just do the case of Stabia Main Port have been safeguarded and indeed carried forward luster with exceptional numbers for this port, remained unused for decades and due to the programming being ensured in the last four months over 190 superyacht prestigious stops at the center of a town of Castellammare di Stabia, with an important economic return for the entire city and especially for the stabiese entire old town. The port of Castellammare is an important economic lung for the whole Vesuvian area and the Sorrento peninsula, and the results achieved in a few months show that we have taken a successful path for the conversion of the ancient Bourbon Basin of Castellammare”. From a technical-constructive point of view the Amerigo Vespucci is a sailing ship with engine; from sailing equipment point of view is “armed to Ship”, so with three vertical masts, jib, main and mizzen, all equipped with masts and square sails, plus the bowsprit protruding at the bow, a proper quarter tree. The unit is also equipped with cutting sails: flakes, at the bow, between the bowsprit and the jib, the stays, between jib and foremast and between foremast and mizzen, and the mainsail, equipped with booms and peak, on mizzen. The length of the ship at the waterline is 82 meters, but between the extreme aft end of the bowsprit she reaches 101 meters. The maximum width of the hull is 15.5 meters, arriving to 21 meters whereas the dimensions of the boats, which protrude from the walled, and 28 meters whereas the ends of the longest flagpole, the foremast trevo. The maximum draft is 7.3 meters. The unit is equipped with 11 boats, two boats, one of which is reserved for the Commander, two motor boats, two motor launches, four small boats sailing and rowing, used for the training of students, and the whaling, also in rowings and sail, traditionally reserved for the commander with the mercy of Officers only. The full displacement load amounts to 4100 tons. 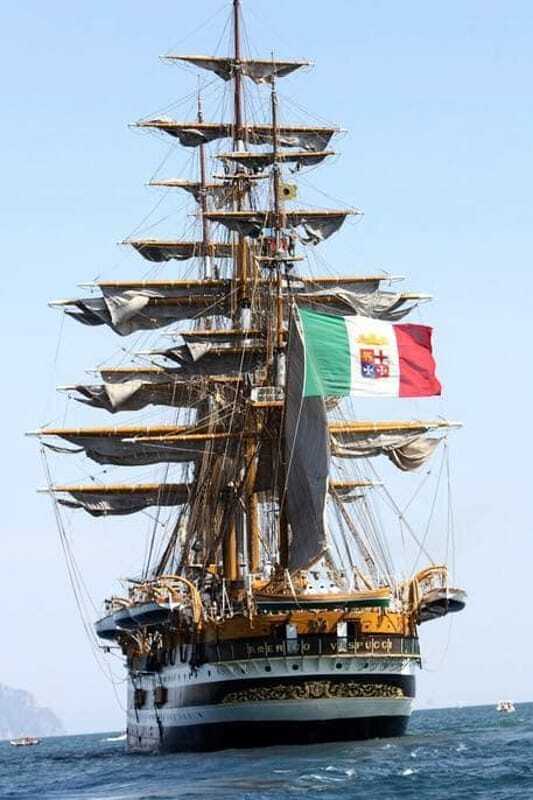 amerigo vespucci, castellammare, castellammare di stabia, evento, news, stabia main port, vela, vespucci.